Gregory the Great (pope, 590-604) wrote his commentary on the Book of Job as an extended discussion on the personal struggle to forge a Christian soul within the self. His theme had great theological and devotional appeal all through the middle ages, making the Moralia in Job one of the most important books for western medieval culture. This copy of it belonged to the cathedral priory of Rochester. At the end of the Moralia, the choir director (precentor) and monk of the priory, Thomas Horsted compiled an alphabetical subject index of the commentary as an aid to study. Thomas's name appears in other inscriptions in the book. 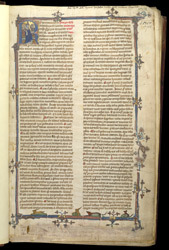 This page has Gregory's preface to the Moralia, in the form of a letter to "Brother Leandro" (Leander of Seville, for whom he wrote the commentary). The enthroned figure in the first letter is probably meant to be a portrait of Gregory dictating the letter and commentary to scribes. In the upper and margins, Thomas Wybarn, appointed prior of Rochester 1462, wrote a prayer and a blessing in verse for Thomas Horsted, as well as an anathema on anyone who would remove it from the library.